LAX FUJ (laxfuj.com) limited lax gear, a British Columbia based brand, has worked out a tentative agreement to produce lifestyle apparel for Finland Lacrosse during the 2008 U-19 World Field Lacrosse Championships. 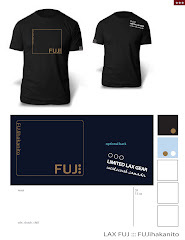 FUJ already creates apparel for several other unique teams, including Bermuda Lacrosse, and is distributed through retail stores in Western Canada. 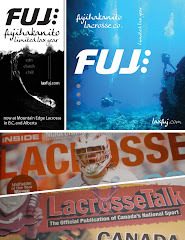 "We're pretty stoked to be working on national team accounts like Bermuda Lacrosse and now hopefully Finland," confirmed Steve Kojima, Marketing Director of LAX FUJ. Kojima, a former All-America star at Simon Fraser and top boxla player in Canada added he always knew there was a niche for quality lacrosse lifestyle apparel and signing international teams has been confirmation. LAX FUJ started in Victoria, B.C. in 2007. The company says it will always maintain its westcoast, limited edition feel that has allowed them to compete with the big names in the market like Nike, Adidas and Reebok. "While we'll likely look at some retail expansion opportunities as we progress, we're never going to go mainstream," added Kojima. "We're definitely going to keep our brand limited in distribution and quantity, 'cause no one wants to rock gear the next guy has on." So far the concept has worked. The brand's legit style is quickly catching on internationally, and with some of the game's best young players including Jordan Hall - the No. 1 overall selection in the last National Lacrosse League (NLL) Entry Draft. "If you're a legit laxer, you're gonna have an opportunity to get our gear," added Kojima. Bermuda and FUJ Lacrosse apparel will definitely be on sale at this year's U-19 World Field Lacrosse Championships in Coquitlam, B.C., July 3-12, 2008. You can now expect to see Finland Lax apparel too.